Polycystic Ovarian Syndrome (PCOS) is a disease of the ovaries. It is a chronic disorder very much like asthma or high blood pressure. The name PCOS is not an accurate name as there are no cysts on the ovaries. PCOS is an imbalance of the female and male hormones. Women with PCSO are born with the problem; it has no specific cause. PCOS has different symptoms. The most common symptoms are irregular menstruation, weight gain and skin symptoms such as acne and abnormal hair growth. It is also often associated with depression and low self-esteem. Ovulation is the process where the ovaries release an egg every month. When the ovaries do not release an egg it causes irregular periods. Women with PCOS often suffer from infertility, as they do not ovulate. PCSO runs in families and is often associated with diabetes and high blood pressure. Nearly all women with PCOS have a close family member (often a parent) with diabetes or high blood pressure. 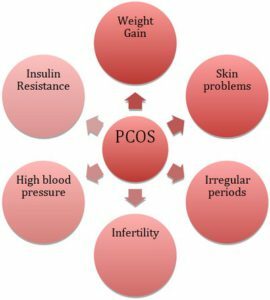 Women with PCOS are themselves at high risk to develop these problems. Many women with PCOS have a precursor of diabetes know as Insulin Resistance. PCOS leads to weight gain, which is caused by the hormonal changes in the body. The weight gain itself is detrimental to the PCOS and makes the symptoms more serious. It leads to a vicious cycle where the weight gain and PCOS negatively affect each other. It is important to break this cycle. Weight loss will lead to improved health and can lead to the restoration of ovulation. However, this is not easy. Women with PCOS are often advised by doctors to loose weight, to exercise and to ‘go on a diet’. But many women feel confused and have tried everything without success. They become despondent as literally ‘their hormones make them fat’. Women with PCOS should follow a specific exercise program as opposed to normal cardio exercise. The right type of exercise is High Intensity Interval Training (HIIT). Research has shown that this type of exercise is more effective for weight loss, as well as beneficial for insulin resistance and high blood pressure. HIIT means alternating short periods of very intense exercise with less-intense recovery periods. HIIT can be applied to cycling, running and many other types of exercise. An example is the 30-20-10 method (University of Copenhagen in Denmark). This is a very good method of exercise for runners. Jog for 30 seconds at a comfortable level. Then you pick up the pace to a moderate speed for 20 seconds. Then sprint as hard as you can for 10 seconds. This is typically done 5 times. So, the total duration of the exercise is 5 minutes. After this rest for 2 minutes and repeat the full 5-minute cycle. So the total cycle is 12 minutes. It is important to get clearance from your doctor before starting on an HIIT program. It is also important to warm up for five to ten minutes before commencing exercise. HIIT can typically be done 3 times per week. HIIT is more effective for weight loss than conventional training, plus it can be done in a shorter time. The key however is to push really hard since the benefits of HIIT are minimal when you do not push yourself to your limits. Women with PCOS should also follow as specific diet. It should be viewed as a permanent lifestyle change and not a temporary fad. It is crucial that women with PCOS understand that they suffer from a disease, which requires that they should eat differently. This is a lifestyle and dietary change comparable to that of people who suffer from allergies. The main culprit for PCOS is sugar and carbs. Things typically to avoid are sugary drinks including all fruit juices. Women with PCOS should never consume sugary drinks. Carbs such as bread, pasta, rice and potatoes should also be avoided. However, if they are consumed rather opt for the low GI alternatives. Processed and low-fat food nearly always contains high amounts of sugars and must be avoided at all cost. Fresh produce is always a better and healthier choice. The Banting (LCHF) diet is suitable for women with PCOS. One of the most common mistakes overweight people make is to skip breakfast. Women with PCOS should make time to have a healthy breakfast and ensure that protein is included. Typical breakfast cereals are high in sugars and should be avoided. Eggs, fruits, vegetables and high protein cereals are good choices. Lunch and supper should include protein and a minimal amount of carbs. Try to avoid snacking between meals. Weight loss is difficult for most people and can be even more challenging for women with PCOS, but the combination of a HIIT exercise program and low carb diet can give satisfactory results. The weight loss will be beneficial for both the infertility and the high blood pressure and diabetes. Thank you so much for this clear , straight and honest information. I am a 36 year old Lady whose been struggling with infertility for thirteen years now. i weigh 109kgs and working hard at reaching my goal weight of 73kgs. Six doctors told me i have PCOS but none could explain to me what PCOS is and what changes i had to make. i had stopped them for a while, he told me to see a dietien which i did but i was still struggling with my weight and infertility, Last year i started reading more about PCOS and started educating my self more about PCOS… None of the Doctors or specialist i had seen before ever told me how difficult it was to loose the weight , how to eat right for PCOS Or how to exercise right to loose the weight. Currently i’m Jogging 5 days a week and start the HIIT Program, thank you for that info, i’ve cut out on all sugars and carbs , I am Banting but struggling with the cravings . I am also currently taking a whole lot of suplements eg, Myo- Inositol , Chromium, Vitamin D3 , Preggy mama, Royal Jelly, Prim Eve and Co Q10 and Will start Accupunture too. After finding and reading ur article it just gave so much hope and confirmed that im on the right part. I am looking into loosing more weight and look for a fertily doctor . Thank you again for ur Amazing Article. It will benefit thousand of woman that were in the dark like me… Its not an easy Journey. God bless.